He comprado este filtro, anteriormente ya compre el de FM, mi duda es, ¿hay una forma especifica de conectar estos filtros?, es decir, ¿tienen diferenciadas la entrada y la salida? I bought this filter, previously I already bought the FM one, my question is, is there a specific way to connect these filters ?, that is, do the input and the output have differentiated? rtl-sdr v3 with upconverter, txco does not work right .. disappointment. But in direct sampling txco works very well, but I have a lot of oveload stations between 4700mhz to 5200mhz and between 5900 and 6200mhz, within the range of ham radio. Many stations mirrored between 3500 to 3800mhz that really hurt my websdr. I do not have it overload with broadcast between 500khz and 1800mhz. My antenna is an 84 meter loop. Any suggestions? Are you using an upconverter that doesn’t have a TCXO? If so, the upconverter oscillator is probably drifting a lot, not the RTL-SDR v3 TCXO. If you’re getting overload the solutions are attenuation or filtering of the offending signals. Injected noise and measured average output of filter, terminated to 50Ohm resistive load. Source used was a Rigol AWG and measurement device a PicoScope digital oscilloscope. Do you have a VNA you can confirm against? Or instead of using noise, can you try a single tone comparison, with/without the filter? I know that many digital scopes put out incorrect results if they get swamped by noise. Edit: Wait are you testing insertion loss or return loss? No VNA, but I shall measure with simple sine waves input on respective frequencies of interest. Share the results when ready. I am calculating insertion loss. Filter works fine business, as advertised! Root cause for the off measurements I had was a faulty probe. Thank you for the professional level of support. I have an SDRPlay RSP2 which is very badly affected by a 5,000 watt AM broadcast station, only 2 miles from me, which kills shortwave reception with images and spurs. I highly recommend this video which demonstrates the amazing effectiveness of the FM filter, and the second half of the same video, which demonstrates the excellent effectiveness of the AM filter. Well done — I just ordered one!! Thanks! The RSP2 has problems with overloading due to the silicon switches used on the front end. If the signal is extremely powerful those switches overload, making the internal bandstop AM and FM filters work poorly. So an external filter like this can definitely help in that case. Received the filter in about 10 days from China. Looks great. Very high quality. Absolutely killed the spurs/intermod from AM broadcast and both of the 5 kilowatt AM stations about 2 miles from me. The SDRplay RSP2 is like a new radio with the filter. No effect on FM broadcast, or SW broadcast bands, which is good, and no effect on the AIR, WX band, or 453 mHz police band. HIGHLY recommended! I have an active RX antenna with a power feeder unit. How do you install this filter? Is it installed between antenna and power feeder? Or is it installed between power feeder and receiver? This HPF does not pass DC, so you’d need to install it between the antenna and powered LNA, or if that’s not possible because the amp is built into the antenna, then between the bias tee and radio. Do not use the filter between the power source and the antenna, regardless of the power source. I use method 1 with great success. Method 2 with built in notch filters enabled still leaves me with massive internal reflections at every multiple of a AM stationfrequency but with additional reflections every 10khz. the same channel every 10khz. I really hate clear channel AM stations. I have one 18 miles from me @ 50,000 watts. I also have several FM stations at 23 miles distance that are 100kw. Method 1 above handles all of it. What’s the insertion loss at higher frequencies? (10’s of MHz through GHz) Can you leave it in place without taking a major performance hit at higher frequencies? A BCAM HPF probably won’t function well at higher frequencies as the SRF of the large inductors required doesn’t go much higher than the HF bands. Update: Tested on the VNA, biggest loss is between 500 – 700 MHz, here it goes over 3dB loss, with the max at about 7dB @ 600 Mhz. Pretty much everywhere else on VHF/UHF is below 2.2 dB loss, so not too bad. Do you plan to make the full FM (62-74MHz OIRT, 76-100-108MHz CCIR) bandstop reject filter? In some countries are broadcast in both standards not only one, hope you make it someday! have you guys ever thought of making like a switchable filterbank consisting of several LP&HP filters (for HF/SWL, could also be used for IF), or something like a combined bandstop filter for BCFM&Airband ATIS (130MHz HPF) and TETRA (for VHF/UHF)? Thnak you for this new product. I ordered one to blcok a strong AM broadcast near my home. I already own the FM filter that gives good result too. Like RF boy, now I’m waiting for the DAB 174–240 MHz band filter. If we do make one we’ll need a few beta testers in Europe for it, so email us at rtlsdrblog_AT_gmail_DOT_com, and we’ll put you down on a beta tester list. Well done. I also want to thank you for developing and rolling out amazing products for our community. Thank you for all your work in this hobby. Your site, information and products are fantastic. I have been looking for an AM filter and here it is. Amazing price also. Thank you. 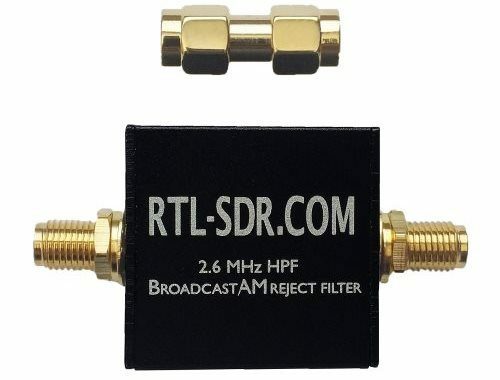 waiting for a DAB Band III 174-230MHZ Bandstop Filter for European User…. Any hope ?